The Arab world reacted with anger to the Israeli premier’s remarks in an interview with Channel 12 News, in which he said he would not rule out the possibility of annexing Judea and Samaria in the future. 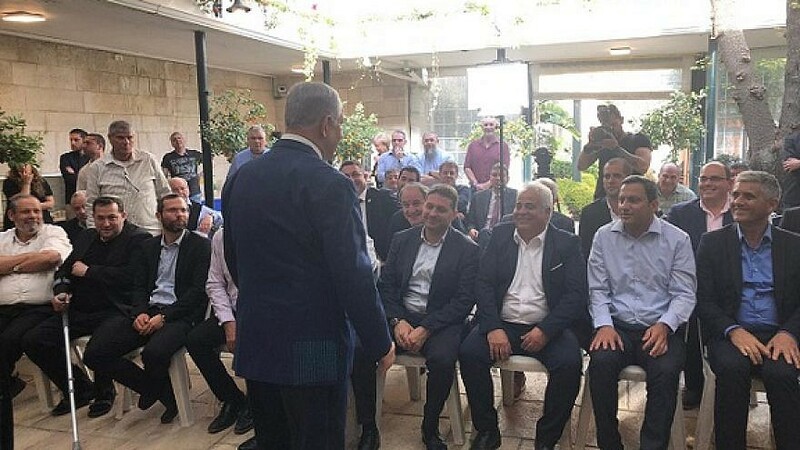 Israeli Prime Minister Benjamin Netanyahu held a brief meeting with heads of local councils from Judea and Samaria from the Likud Party on April 7, 2019. Credit: Likud Party. (April 8, 2019 / Israel Hayom) Between his many interviews with the media ahead of Tuesday’s elections, Israeli Prime Minister Benjamin Netanyahu found 15 minutes on Sunday to meet with heads of local councils from Judea and Samaria from the Likud Party. “Netanyahu says he is worried. Is this a tactic or reality? Probably both,” one attendee posited. In the meeting, the prime minister reiterated the mantras that he has recited these past weeks. “I was in this situation in 1999 [when Ehud Barak’s Labor Party defeated Likud at the ballot box]. Now, I recognize a similar problem. If we don’t change the trend, we are going to lose,” he warned. Meanwhile, the Arab world reacted with anger to Netanyahu’s remarks in an interview with Channel 12 News on Saturday night, in which the prime minister said he would not rule out the possibility of annexing Judea and Samaria in the future. The Palestinian Authority in Ramallah also condemned Netanyahu’s remarks. Chief Palestinian negotiator Saeb Erakat accused Netanyahu of “destroying any future chance of returning to negotiations and a peaceful resolution [to the conflict]. We will turn to the International [Criminal] Court in The Hague,” he said.